Rob Lowe has joined Valspar Paint and Habitat for Humanity International in unveiling Valspar Hands for Habitat, an initiative to auction the handprints of celebrities and notable personalities to benefit Habitat for Humanity’s relief efforts in Haiti. Habitat has set a goal to serve 50,000 families impacted by Haiti’s 2010 earthquake, helping move them toward safe, secure and permanent housing. Those donating to the auction created their handprints using Valspar paint. 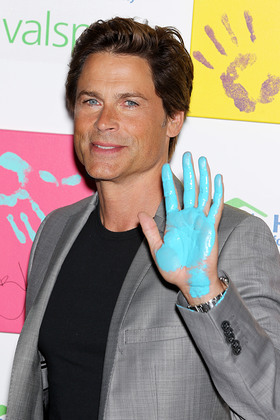 In addition to Rob Lowe, other notable personalities donating their handprints to the Valspar Hands for Habitat initiative include Andy Cohen, Angie Harmon, Ashley Greene, Calvin Klein, Cynthia Rowley, Donnie Wahlberg, Ellen DeGeneres, Ethan Hawke, James Earl Jones, Jamie Lee Curtis, Jason Sehorn, Jonathan Adler, Katie Couric, Kid Rock, Lauren Conrad, Naomi Watts, Nate Berkus, Paula Deen, Susan Sarandon, Teri Hatcher, Tori Spelling, Vanessa Williams, Zac Posen, Brittany Snow, Cyndi Lauper and many more. In a nod to Haiti’s historically colorful homes and Valspar’s belief in the transformative power in color, the handprints were made using a variety of Valspar Paint colors. In addition to proceeds from the auction, Valspar is also donating $1,000 for each set of celebrity handprints donated for auction. Valspar is encouraging the general public to support this initiative and “lend a hand” by taking a picture of their own hands and posting it to the Valspar Paint Facebook page at www.Facebook.com/ValsparPaint. For every photo received, Valspar will donate $1 to Habitat for Humanity. The Valspar Hands for Habitat program is part of an ongoing partnership between Valspar and Habitat for Humanity International. Valspar Paint has donated more than $40 million in cash and paint contributions to the organization. Valspar and Habitat recently marked their long-standing partnership by celebrating the 1 millionth gallon of Valspar Paint donated to Habitat. The Valspar Hands for Habitat auction went live on Monday, August 22nd at 8:30 a.m. For additional information and to find out how you too can “lend a hand”, visit www.Facebook.com/ValsparPaint.